The solutions and explanations to the questions on how to factor polynomials by grouping are presented. 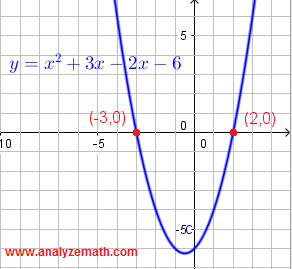 The graph of the given polynomial in b) above y = x 2 + 3 x - 2 x - 6 is shown below. x = - 3 makes the factor (x + 3) equal to zero and x = 2 makes the factor x - 2 equal to zero. Both x = -3 and x = 2 appears as x-intercepts in the graph of the given polynomial. Figure 1. Graph of polynomial x^2 + 3x - 2x - 6. Conclusion: One way to check our factoring is to graph the given polynomial and check that the x intercepts corresponds to the zeros of the factors included in the factorization. f) Note that there are 5 terms in the given polynomial with common factor to all of them. Rewrite the polynomial replacing - x by - 3 x + 2 x as follows.